Around 300 members of Kalipunan ng Damayang Mahihirap or Kadamay stepped out of the pro-urban poor organization, and exposed their alleged corrupt practices, like forcing members to pay or attend rallies. The members drmatically threw their Kadamay identification cards to the ground and stomped them, while chanyting the name of President Rodrigo Duterte. Bueno Cayman, one of the leaders of the group that went away from the group, said that they were tired of the organization's tricks. The members who quit claimed that they were forced to attend protest actions against the President. “Yung sinisingil po kami ng 150, 200, 300, makapag rally lang po. Hindi libre, kami pa po ang nagbabayad nun,” Jeffrey Ariz said. Ariz claims that they were required to give money. It’s either you cough up or face the specter of threats and harassment from Kadamay officials and their henchmen, he said, adding that some were told to just simply pay up. “Minsan sinasabi ‘wag na kayo sumali sa rally magbigay na lang kayo ng 300,” said Julieta Dela Cruz. Another anonymous member said that he was given a housing unit only after giving into the demands of a Kadamay official for him to give money. He was allegedly asked to produce P15,000 in exchange for a guaranteed slot in a vacant housing project. After bargaining, it was reduced to P10,000. A final deal was made, he would pay P7,000 and settle the P3,000 balance later, at the onset of Kadamay’s takeover in Pandi, Bulacan in May 2017. “Ang palabas nyan, sir, bayad para sa “lakbayin” pero hindi totally “lakbayin,” binibenta po sa amin yun,sir, he said. Charlene Andesa said that she was never given the housing unit that she was promised, even after she paid for it. “Nagbigay po ako ng isang buong baboy po. Hangggang ngayon wala pa po akong bahay. Pinapangakuan lang po ako,” she said crying, when interviewed by GMA news. Faced with the allegations, the Kadamay Pandi, Bulacan Chapter has shrugged off the apparent exodus, denying the corruption allegations. Pat Tupas, chairperson of the organization, said, “Voluntary po ang paghingi ng suporta para sa mga “lakbayin". “Hindi tinotolerate ng organisasyong Kadamay ang ganitong mga taong nagtitiwalag at nilalabag ang batas,” he added. He said that Ariz, one of the leaders of the group that rebelled, was once stripped of his authority as an official of Kadamay after he was caught acting as an agent in the illegal sale of vacant housing units in Pandi. Ariz denied the claims, and stood firm on his cause to expose the alleged wrongdoings of the org. 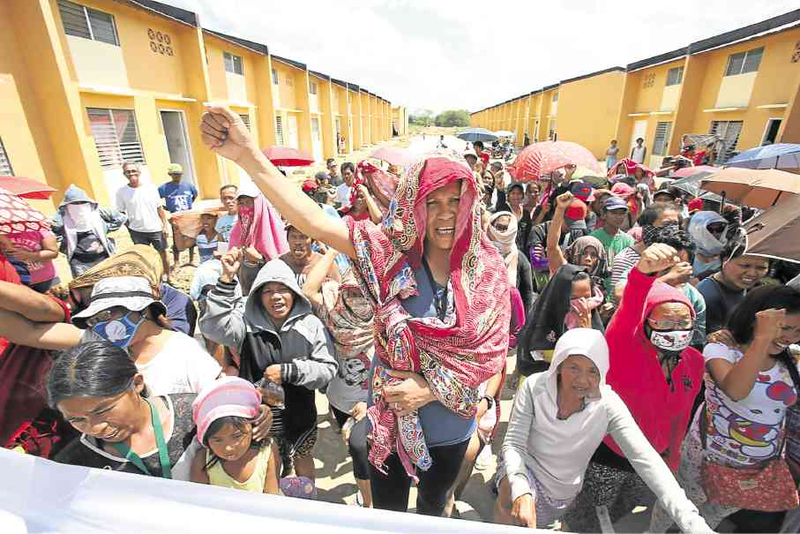 The Kadamay has been actively astaging protests against the government and can be recalled to have occupied housing units for policemen and the armed forces without authority to do so.